Hey everyone! Good Monday morning to y'all! Monday morning is never really good. Especially when I do not have a comic on hand ready for you guys. Anyways, I just got back from a recent trip and yes once again I managed to put myself in a jam of not having a comic on time. But despite the packed schedule, I have still managed to cough out a strip for your usual Monday morning read. A promise is a promise, right? Jon actually can't remember anyone's birthday. So if you do not have your Facebook birthday notification enabled, then please forgive him if he doesn't wish you. Everyone should just help Jon remember things. We can't do it all the time. Anyways, this strip is dedicated to Jon's mom! Yesterday was her birthday so here's a random birthday wish! Without her there will be no Jon for us to laugh at! Thanks Jon's mom and happy birthday! Sorry for making your son look like an idiot all the time. 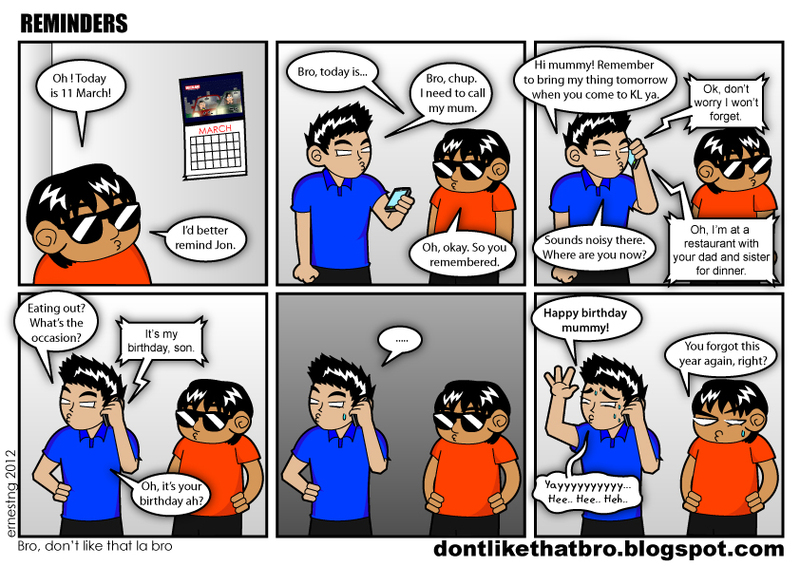 On a side note: why the hell Shamus actually remembers Jon's mom's birthday? lol~ Happy birthday Jon's Mom! p/s: I have a hard time remebering anyone's birthday too. hahah! adui. dah kantoi dah... fail la you, jon. Kenot cover anymore. he kantoi so many times d. apa nak buat. since i don't have facebook, i make yahoo mail to remind me those important dates. anyway, happy birthday to jon's mum! yahoo mail reminders are effective? never tried it before tho. is it every year Jon like that? quite awful. almost every year la. haha. he just has really bad memory! I don't think he will even remember his gf b'day if he had one! he forgets to put reminders on his phone as well! thats how forgetful he is! !